The first time I've ever made New Year's resolutions, so good so far! I don't know if it's an age thing? However, this year is the first year I have felt I should make some New Year's resolutions and stick to them. Perhaps this is because I know what I would really like to achieve from them, rather than just plucking at resolutions because it's January and thinking you ought to. 2. Less Social Media time. 1. 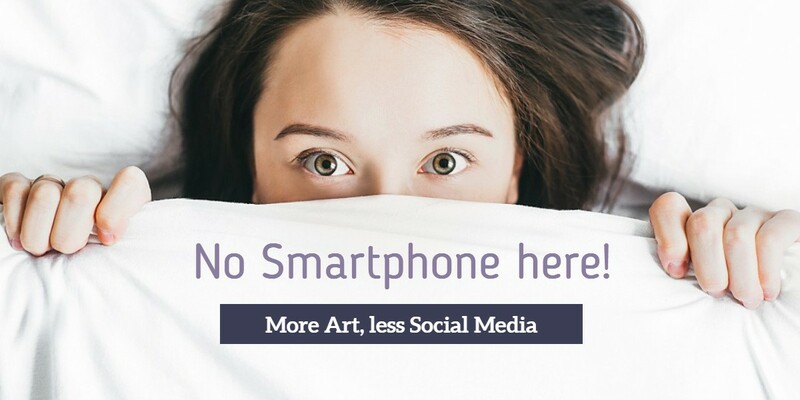 Absolutely no looking at my phone in bed, either at night or first thing in the morning. 2. No sound notifications on my phone for all apps or texts. If you don't know how to switch off sound notifications for individual apps, just ask Google, there is always a way. 3. Removing Facebook and Twitter apps from my phone altogether, if you do need them you can use your browser which also means less space taken up in your phone's memory. 4. Remembering that "less is more", posting only relevant and interesting content less frequently than before. I have found these rules easy to stick to and would highly recommend them, especially having no sound notifications. When in the Studio you become absorbed in your work and time passes without you knowing it, the less distractions the better. In addition to these rules, I have been seriously considering closing my FaceBook account altogether. I use FaceBook less and less and much prefer the more instant and crisper look of Instagram. However it is a useful tool occasionally for advertising events locally and reaching a different demographic to that on Instagram. Resolutions 3 and 4 might be a little more tricky to stick to, but so far, so good. I have always enjoyed swimming a couple of times a week, I have increased that to 5 times a week since Christmas and as it is something that I enjoy, I am sure I will continue. I have also increased the amount of time on my morning exercises, including the cross trainer. Setting my alarm clock at an earlier time and not snoozing it, means I have the time to fit this extra exercise in. The diet is requiring a little more will power! I began after New Year and am chuffed to have lost 5lbs and 2inches. To help my will power and keep my resolve I have signed up to complete a fell walk of 10 peaks in 10 hours this Summer. Now I have signed up and told all my friends, I will have no option but to stick to it. Resolution number 1 of creating more Art will hopefully be a natural consequence of sticking to resolutions 2,3 and 4. In the coming months I will let you know how I'm getting on and hopefully will be posting more of my new paintings on Instagram for you to see. Have you some New Year's resolutions in 2019? Can you stick to them? Have you tips to share?